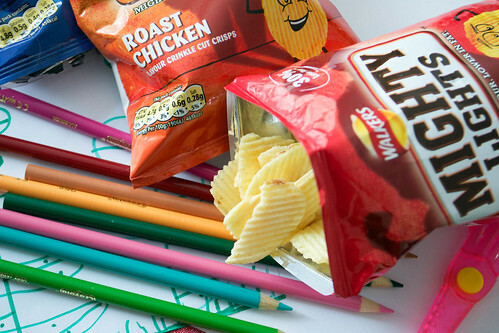 Walkers couldn't have timed the release of their latest crisp more perfectly - just in time for the kids going back to school in September, with parents all over the country furrowing their brows over what to put in packed lunches. They sent me a packet of each flavour for us to try. The new Mighty Lights crisp comes in the following flavours: cheese and onion, lightly salted and roast chicken. They're ridged, which makes them feel a bit more like a 'grown up' crisp - no puffy shapes here, just proper big, crunchy crisps. The girls ripped open the packets and quickly decided that the roast chicken flavour was their favourite, followed by the cheese and onion. The flavours are bold and natural-tasting, without being too strong. The lightly salted flavour was just that - it didn't taste too salty, which is great as salt levels are often a worry for parents, especially when you add up what's in the rest of the lunchbox such as ham, bread, cheese and olives etc. Personally, I don't drop a packet of crisps in the girls' lunchboxes every day - maybe once or twice in a week - but they did like these and I'd consider them for their 'crisp' days. 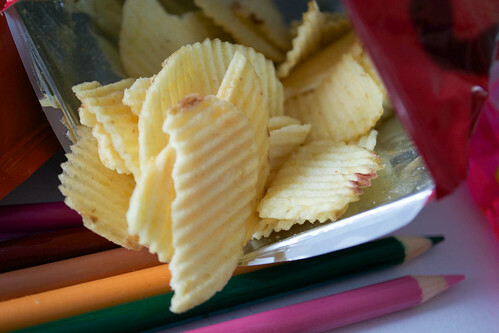 Walkers say they have 30% less fat than standard crisps, no artificial colours or preservatives and no MSG. You can pick them up at the shops for £1.79 for a pack of 6. Have you tried Walkers Mighty Lights crisps? What do you think of them?